EVERCOOL is going to launch a low profile CPU cooler, the 1.5U—HPL-815. Four 6mm heat pipes connect directly with the CPU and supports up to 130W of heat dissipation. Therefore, heat can be rapidly dissipated and the CPU temperature effectively decreases. 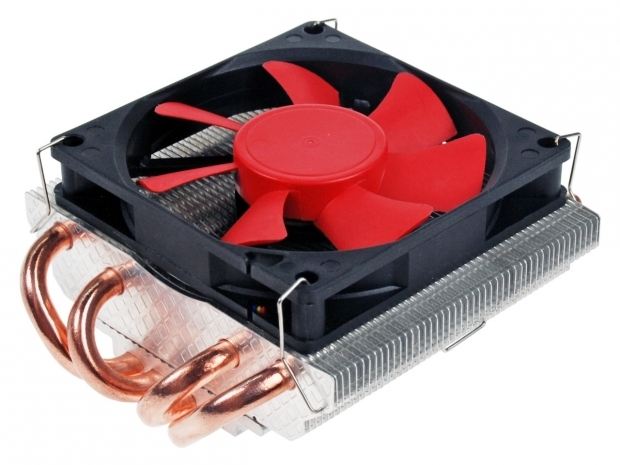 The HPL-815 becomes an 8cm fan when placed on the heat sinks, which help to make the airflow smoother. Additionally, the PWM function can automatically control and adjust the fan speed up to 4000RPM by detecting the CPU temperature in order to successfully dissipate the heat. This fan has been developed by EVERCOOL, and supported by its many years of experience. Even when its speed reaches 4000RPM, it’s still noiseless and thus provides a silent cooling solution. Its height is only 46mm so to avoid touching other parts on the motherboard while installing it. HPL-815 not only can be installed in any brand of cases, but also its low height is suitable for slim cases and HTPC cases. The universal clips give users different and easy installation choices. HPL-815 is compatible with Intel LGA 1156/ 1366/ 775 and AMD AM3/ AM2+/ AM2/K8/ 940/ 969/ 754.
it features 80x80x15 as far as i see. it's rather hard to believe that this cooler can provide noiseless operation at high RPM.